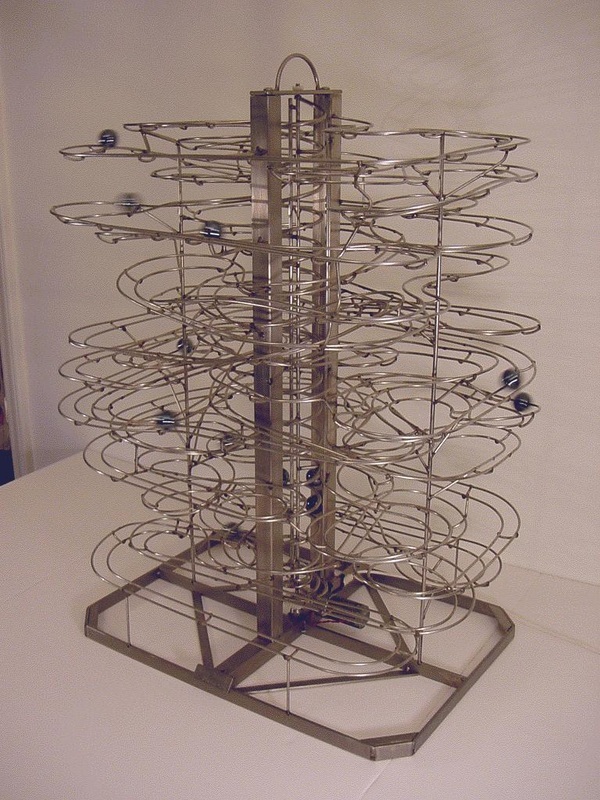 This sculpture, Two Track Mind, has a continuously running motorized screw lift, which feeds two interlaced tracks. The sculpture was designed to create constant visual movement while producing a "white noise" effect in the background. The screw lift feeds glass marbles through the central structure. Once the marbles arrive at the top, they bob and weave each other as they descend. The two tracks are connected in a figure-eight pattern so all the marbles can travel both tracks. Two Track Mind is part of a private collection and was completed in 2003. The sculpture is 22" long, 16" deep, and 28" high. Two track mind was the first commissioned sculpture that started it all. Though my style has changed quite a bit since then, the roots are the same.